Come and enjoy an unforgettable experience in Gaspésie and enjoy a day filled with activities at Penouille Beach. You will find bicycles, quadricycles, electric bicycles, kayaks, paddle boards, beach chairs, umbrella, games and beach toys available for rental! Schedules may vary depending on weather conditions. This summer from June 17th to September 4th, rediscover the beach of the Penouille Peninsula with Ecorecreo. Enjoy a moment of rest with both your feet in the sand or head out on an adventure using our exclusive gear! Écorécréo is giving you the chance to discover the charm of Forillon Park during exclusive excursions in Gaspé Bay on paddleboard. 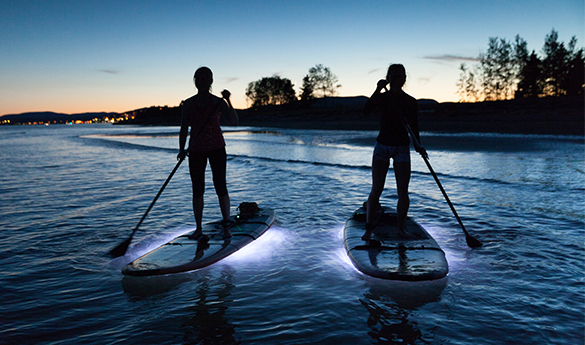 You have several options, whether a beginners’ course on paddleboarding, exploring the seafloor, a nighttime outing with our LED-equipped paddle boards or admiring the landscape at sunset. In every case, we have the ideal outing for you! 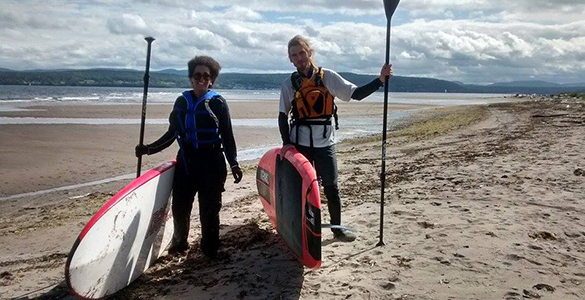 VWith our certified guide, you will learn the basic rules for manoeuvring a paddleboard, including getting up, turning and paddling, to make the best of your outing on Gaspé Bay. Accompanied by our adventure guide, admire the sun as it sets over Gaspé Bay and enjoy a moment of tranquility while observing the cliffs of Forillon and the seabirds. A unique opportunity in the Gaspésie region, this is an unforgettable outing that should definitely be on your bucket list when visiting Forillon Park. With our certified guide, you will softly paddle in the darkness of the night and will discover the seafloor of the bay. With our paddle boards lit up from below, you can see lobsters, jellyfish and other sea creatures. Will you have the chance to see the bioluminescence of phytoplankton light up the waves? Board, paddle and lifejacket included. Dress suitably for the weather conditions. Follow the safety rules stated by our guide at all times. Because safety is our priority, the activity may be postponed at the last minute because weather conditions or other conditions do not allow for a safe outing. For more information, contact Écorécréo or call 418 360-7292. * Upon presentation of proof of accommodation on the Forillon National Park site, visitors get 10% off. A day filled with fun activities! (Get 10% off on equipment rental upon presenting your Parks Canada lodging ticket). Gaspé Residents* Gaspé residents get 10% off before noon, with proof of residence required (recreational equipment rental only). Take Route 132 from Forillon Boulevard. Founded more than 15 years ago, Écorécréo can be found on several tourist attractions in Quebec. Écorécréo sells and rents out various recreational equipment and vehicles, including quadricycles, pedalos, kayaks, SUP, Segways PT and electrical bikes. Offering a wide array of innovative and environmentally friendly products specifically designed for leisure activities and the outdoors, Écorécréo’s mission is to serve city dwellers, tourists, visitors, boaters, sports enthusiasts and strollers alike by giving them access to quality equipment adapted to their specific needs – both in summer and in winter. Opening hours vary from site to site, please visit each site’s page for details. © 2017 Groupe Écorécréo inc. Tous droits réservés. Écorécréo est une entreprise associée au Groupe Écorécréo.